These winners are trading at a rare discount. Top stocks produce amazing returns over the long run. All too often, investors who prefer to add stocks to their portfolios when they're trading at a discount end up missing out entirely because many top-performing companies rise dramatically for long stretches without giving would-be shareholders a chance to buy in at a bargain price. That's what makes it all the more important for investors to pay attention when strong-performing stocks do give them the opportunity to buy shares on the cheap. 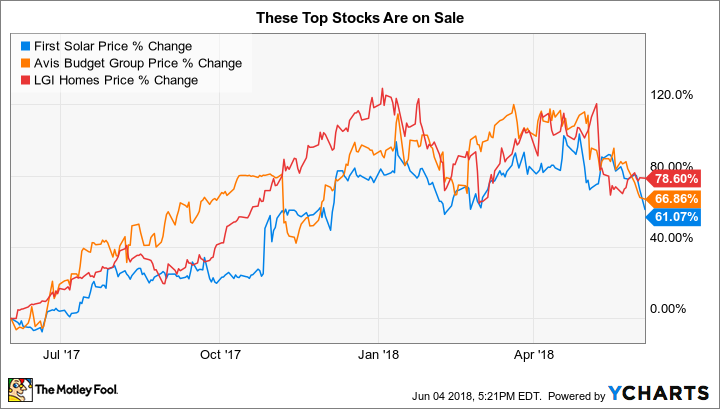 Shares of First Solar (NASDAQ:FSLR), Avis Budget Group (NASDAQ:CAR), and LGI Homes (NASDAQ:LGIH) have all seen declines of 20% or more recently, but they're still up more than 60% over the past year and have plenty of opportunity to rebound from their latest setbacks. First Solar is one of the biggest solar energy companies in the world. Solar has been an up-and-down industry in recent years, with triple-digit oil prices in the early 2010s helping to support huge demand for panels before crude's crash sent solar players into a big slump. More recently, most of the attention on the solar industry has been on whether and to what extent the U.S. would impose tariffs on imports of solar panels. Many of First Solar's competitors were affected to tariff proposals, but because First Solar uses a different technology to produce thin-film solar panels that weren't included under the proposals, it got a huge competitive advantage that has led to expectations of dramatically accelerating growth. What's sent First Solar's stock downward in the past month has been the fear that tariffs on competing solar cells and panels might end up getting reversed. A bill in Congress has sought to eliminate the current 30% tariff on solar panels, and that would potentially crush the margin levels that First Solar could see on its Series 6 panels based on current tariff rates. If you think those fears are overblown -- especially given the expansion of trade disputes into a much broader set of areas -- then First Solar's strategy of making solar-panel hay while the sun of tariffs shines could well lift its shares back upward. Avis Budget Group has been a giant in the rental car space for years, but it's been smart in realizing the potential threat to its leadership position in the industry. The rise of car-sharing services has had an impact on the rental market, and many investors have feared steady erosion of traditional rental car businesses over time. That's part of what makes Avis Budget's moves to acquire car-sharing pioneer Zipcar and to make partnerships with autonomous car innovator Waymo exceptionally forward-looking. Yet investors don't seem convinced that Avis is on the right road to long-term success. The company's first-quarter results included a solid 7% rise in revenue, and adjusted net losses were narrower than expected as Avis said that stabilizing prices and higher utilization rates helped the business. Shareholders focused instead on a slight shortfall in full-year earnings projections, even though the stock still trades at an attractive multiple to those forward earnings forecasts. With Avis in a good position to chart a course through competitive pressure to sustain its business, investors with a willingness to take risk could see this as a great time to look at a purchase. Most people don't think of homebuilders as being high-growth prospects, but LGI Homes is a special case. The company works hard to focus on helping families make the initial transition from rental properties into starter homes. After the housing crisis of the mid-2000s, it was very difficult to sell starter homes as terrible experiences among homeowners who'd gotten burned by bad timing convinced would-be buyers to stay out of the market. At the same time, the generation of millennial young adults struggled with financial constraints that made it difficult for them to be able to afford homes. Yet by the time LGI went public in 2013, conditions were starting to improve. LGI's numbers have been fantastic, including sales and income that just about tripled between 2013 and 2017. Now that more millennials and other budget-conscious first-time homebuyers have started entering the market, LGI's timing has turned out to be perfect. Fears about rising interest rates have some worried about a pullback from buyers into the housing market. Yet with so much pent-up demand, it'll likely take a lot more to stem the flood of millennials into homes of their own -- and LGI stands to reap the rewards accordingly. It's important to note that even though these stocks have dropped 20% doesn't necessarily mean that they can't drop further. Yet over the long run, you'll do better with winning stocks if you're disciplined in buying them during brief dips. Even if you don't end up picking the exact bottom, long-term gains can more than make up for any short-term pain you suffer.